This morning, the boys and girls in Year 3 celebrated their Class Mass in fine style…in all respects! 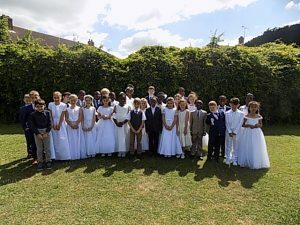 The boys and girls all looked splendid as they came to school in their First Holy Communion outfits for what was a truly special celebration to mark the receipt of the sacraments of reconciliation and holy communion during the last few months. Following their special Mass, the boys and girls enjoyed a lovely ‘picnic’ lunch with their parents on the school field. Many thanks to those parents who made a contribution towards the picnic lunch…it was truly appreciated by the boys and girls! What a lovely celebration…thank you, Year 3! This entry was posted in General News, Masses and Prayer Services, Special Celebrations, Year 3. Bookmark the permalink.